It's Sunday today and my hubby and I went to church this morning and tonight. We were always blessed with our pastor's messages. He's such a good preacher and evangelist. 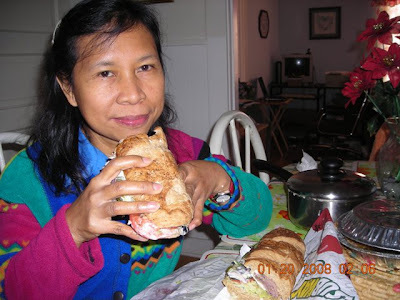 While on the way home from church this morning, hubby and I agreed that we just buy our lunch at Subway. It's been a while that we haven't had sandwiches from there. We came home first and changed his clothes because he was wearing a suit. Then he went to buy our lunch in Subway. 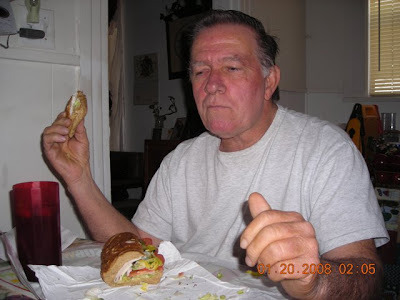 When he came back, he told me he bought three footlong sandwiches. They have a special offer of buy 2 and get 1 free. I ordered a roast beef sandwich with everything on it except jalapenos. Hubby got ham and turkey sandwiches. 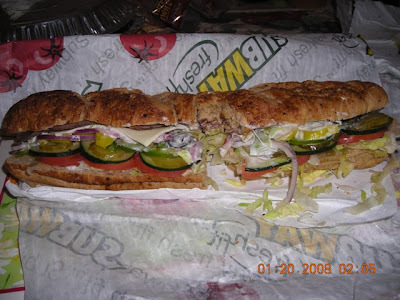 I can't eat all the footlong sandwich in one meal so I ate the other half for supper. Hubby ate his ham sandwich for lunch and the turkey sandwich for supper. It saved me from cooking today. wow! ang laki ng sandwich! looks so yummy... good thing nakakapag attend kau ng mass ng mister mo. yung asawa ko.. naku! pwersahan! nakakabadtrip nga tapos strong pa naman daw yung beliefs nya, parang impossible to believe. lol.